“Last time there was this much excitement about a tablet, it had some commandments written on it.” Wall Street Journal. Steve Jobs created the iPad to revolutionize the way people thought about and used computers, but in developing a device which combined Internet browsing, music video and more in a form that resembled consumer electronics, not PCs, he may have also changed the face of digital signage forever. Tablets aren’t new. Microsoft put a tremendous effort in the marketing and development of tablet PCs in the early 2000s — so why have they seemingly become so popular now? While the short answer might be because Apple made it cool, there really is more to it than that. One reason is the continued advancement of hardware technology. Chips that are more powerful, but produce less heat and consume less energy have helped create tablets that are nearly as powerful as laptops. Another reason is the screen itself. The development of bright, high-resolution touchscreens means attractive, engaging displays. Other important hardware factors include long battery life, WiFi and cellular integration, and advancements in memory and storage. These hardware advancements have enabled manufacturers to create tablets that are thinner and lighter than previous tablets, which make them more attractive to consumers. Another reason is software, or more specifically, the way that software runs on a tablet. It doesn’t matter which OS a person favors, because when it comes to software, both have followed the same general game plan — apps. Everything changed when Apple introduced Software Developer Kits (SDKs) and the App Store. Suddenly, tablets had the flexibility to become the platform for anything a developer wanted them to be. A large majority of apps developed for tablets fell into consumer-friendly categories, but businesses quickly seized the opportunity to develop apps that modify tablets for their own use. In what seems like the blink of an eye, tablets are now everywhere, but the primary target audience seemed to be consumers. What about tablets made them so attractive for use as digital signage? Tablets are, relative to many forms of digital signage, cheap. In many cases, an agency can specify multiple tablets for the price of one large digital sign. Tablets are mobile. Generally speaking, tablets don’t require teams of people to move around. They don’t need electricians or cabling specialists to reset their configuration. It is incredibly easy to set up a tablet that provides tremendous flexibility for ongoing use. This enables agencies to utilize small digital signage without consideration for installation. Tablets are multipurpose. The iPad, for example, can be a video player, an Internet device, a touchscreen kiosk or one of a thousand different devices depending on the App. The “all-in-one” concept of the tablet enabled developers to write software that took advantage of these features. Suddenly a video player could also be a touch-screen device that returned real-time information via the Internet. This flexibility makes the use of tablets quite popular. It also helps that the industry has begun to align toward a set of open source standards, such as HTML5, which reduces the need for proprietary design to achieve goals. Maybe most of important of all, people “get it” when using a tablet. The dramatic rise in tablets (and touchscreen cell phones) has trained consumers, who are usually the target audience of such signage, to properly navigate tablets. Regardless of manufacturer, people grasp the concept of ‘touch’ ‘swipe’ and ‘tap’ and ‘pinch’ and ‘expand.’ One of the challenges of introducing digital signage has been making sure the user interface was simple enough for people to understand. Devices may have different interfaces, which makes it hard to “train” consumers to use them. By adhering to the same functionality that has become common to consumers, people are able to use, and be engaged by, tablets easier than other devices. This makes agencies more willing to specify them for digital signage. There is no doubt that tablets have become ubiquitous in today’s society. Even though some manufacturers have recently exited the field, tablets are here to stay. While large-scale digital signage remains the norm, it is quite possible to envision a day in the not-too-distant future when the number of tablets placed as digital signage exceeds other forms. It probably seemed far-fetched that mobile devices would exceed all other forms of computers, but that’s become fact, so it is possible. The question still remains, is the recent dramatic rise in tablets being used as a digital signage platform an evolution or a revolution? It is because of an evolution in technology that Apple was able to redefine the concept of a tablet computer. It is also a revolution because small groups of people across different disciplines saw the potential of tablets for use in digital signage and began a movement to replace large-scale digital signage with multiple, smaller, tablet devices. A STEM (Science / Technology / Engineering / Math) graduate and COO of bloomfield knoble, Thomas exemplifies Basem Nayfeh’s view that “advertising is becoming an engineering discipline.” Thomas has 20 years of award-winning experience in advertising and cutting-edge technology. His latest project involves quantum information systems for digital signage. "Evolution or Revolution? 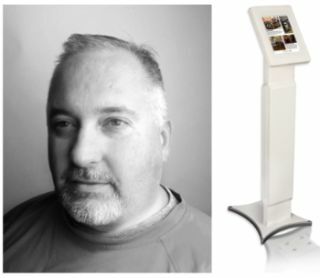 The Changing Face of Small Screen Digital Signage,"